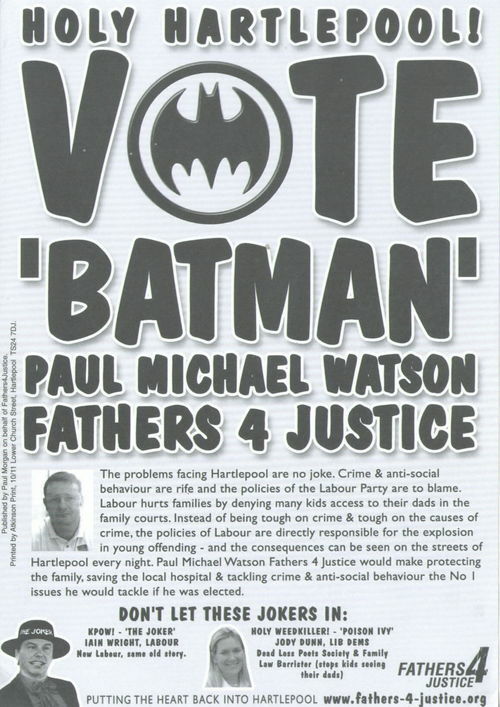 Paul Watson, the Fathers 4 Justice candidate in the Hartlepool by-election last month, is due at Hartlepool Magistrates this Wednesday 20th October from 9am. He was arrested following a purple powder throwing incident at the by-election count. He is charged with criminal damage and common assault for throwing purple powder at Jody Dunn, another candidate and also a family law barrister. Anyone who can get along to support him would be welcome. Just hours before they launch their first election campaign in the Hartlepool By-election, campaign group Fathers 4 Justice revealed last night that the Prime Minister has invited the groups North East Co-ordinator and Hartlepool Candidate Paul Watson for talks about access rights for dads. The Fathers 4 Justice (F4J) protestor who scaled Buckingham Palace dressed as Batman last Monday today vowed to escalate the campaign against the Labour Government just hours before he appears in Bristol Family Courts tomorrow (Monday) in his battle to see two of his children.